Hand anatomy. 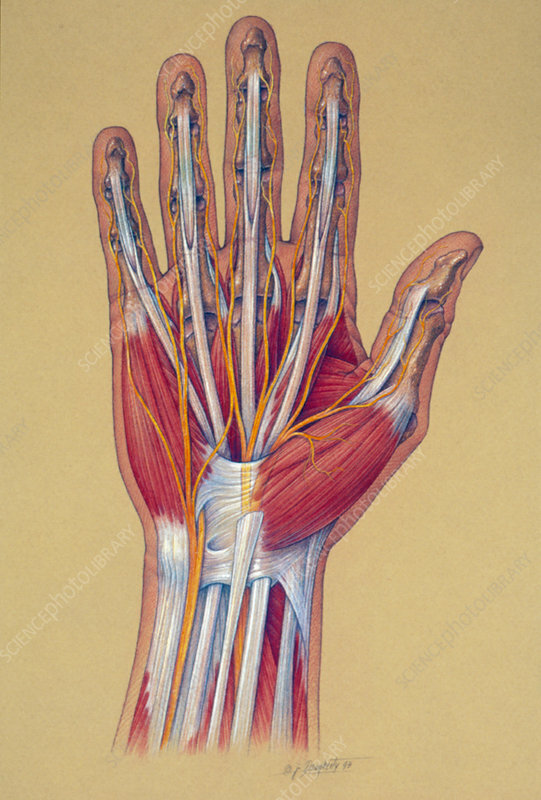 Illustration of the internal anatomy of the hand, showing muscles (red), nerves (yellow), tendons/ligaments (white) and bones (brown). The large nerve seen running along the centre of the wrist and passing under a ligament is the median nerve. Compression of this nerve in the "tunnel" formed by the carpal bones of the wrist (not seen) and the ligament (the transverse carpal ligament) can trigger carpal tunnel syndrome, where inflammation of the nerve causes pain, tingling or numbness. It is one form of repetitive strain injury (damage caused to soft tissues caused by repeated physical movements). It can be avoided by rest or proper wrist support.